Wine: Drink half a glass per child, per day. That was the answer a mom of many children gave me when I asked how she did it all several years ago. Of course, she was saying that she drank half a glass per day for each child she had (not that she gave it to the kids… in case that was unclear). And she was half joking (but only half) since with the number of kids she had, she would have been drinking several bottles a day. The fruit of the vine is a natural choice to accompany almost any meal. There is quite literally a wine for every occasion. Lord, give me coffee to change the things I can, and wine to change the things I can’t. All joking aside, it has been extensively studied for its health benefits and its affect on mood, heart health, and longevity. You’ve probably seen the headlines over the years about the heart health promoting benefits of red wine. These heart benefits have been well-studied. Recent research has uncovered many other benefits to this age-old fermented drink as well. “To the best of our knowledge, our study provides evidence for the first time that the flesh of grapes is equally cardioprotective with respect to the skins,” the researchers report. Red wine contains Resveratrol, which is not found in white wine, but recent research has called its benefits into question. The study looked at elderly residents in Tuscany and found no noticeable difference in the Resveratrol levels in the urine of those who lived longer vs. those who didn’t. Studies about the benefits of Resveratrol have typically looked at how it affects cells in a lab setting. This isn’t necessarily an accurate representation of its role in the body. At the same time, just measuring urine levels may also not provide a clear picture of benefit. From all of the research I’ve read, I’m not sold on the benefits of Resveratrol, as we’d essentially have to drink wine non-stop and swim in it constantly to reach the concentrations used in lab studies. At the same time, it isn’t the only beneficial compound in wine, and I think there are other benefits far beyond Resveratrol. These studies also show that no compound, no matter how beneficial, can replace the importance of a healthy lifestyle. Alcohol consumption should just be a small part of an overall healthy lifestyle of a good diet, quality sleep and movement. How Much Red Wine is Good for your Health? It is important to note that all of the studies found the most benefit from moderate consumption of wine. The Dietary Guidelines for Americans define moderate consumption as one glass per day for women and up to two glasses per day for men. Note: The good news for those who choose not to drink is that it is possible to get many of these same health benefits from other sources (although it will be much less enjoyable to do so ? ). For some people, the only benefit they care to understand is that it tastes great and helps take the edge off. If you are interested in a little more of the research and understanding the nuances of what makes a great wine, read on. Please note that not all wines are created equal. Some have a host of additives that can negate the benefits and be downright harmful, but I’ll discuss that later. A more recent study found an even more noticeable benefit to those who drank regularly and exercised regularly. The benefit of the two combined exceeded the benefit of either on its own. In this study, called In Vino, Veritas, researchers actually introduced the fruit of the vine to non-drinkers to track the results. The participants drank moderate amounts of wine five days per week. Moderate amount was defined as 2-3 glasses per day for men and 1-2 glasses per day for women. Drinking wine did not seem to affect cholesterol, blood glucose, triglycerides, or levels of inflammatory markers like C-reactive protein. It also did not negatively affect people’s livers during the year. The researchers then looked at the data of those who drank and exercised. Those who worked out twice per week and drank saw significant improvement in cholesterol levels. They increased HDL and decreased LDL after a year of regular moderate wine consumption. In this study, the effects were the same with red or white wine. According to a 2007 study out of Finland, wine drinkers have a 34 percent lower mortality rate than beer or spirits drinkers. An abundance of anecdotal evidence supports longevity claims as well. In a blue zone (area with a high concentration of people who live longer than most places in the world) in Greece, residents consume wine daily. Researchers think this may be part of the reason for their longevity. Other reasons include consuming a lot of vegetables and good relationships with family and friends. At the end of the day, many of us can agree that blue zones and studies aside, wine improves the quality of life! Wine may also have positive effects on the brain. A 2006 Columbia University study found that brain function declines more quickly in nondrinkers than in moderate drinkers. Those of us who appreciate a nice glass of wine don’t need studies to tell us this. It turns out that wine may have a clinical benefit for happiness and mental health as well. A Spanish study (this one) found that those with a moderate consumption of 2-7 glasses a week were less likely to suffer from depression. Alcohol may make us look like we are aging more gracefully when we look in the mirror. Wine may actually help us age more gracefully. These same procyanidins may also help improve the appearance of skin and reduce wrinkles, though the studies aren’t as definitive on this. In a perfect world, wine drinking would have all of those benefits without any downsides. 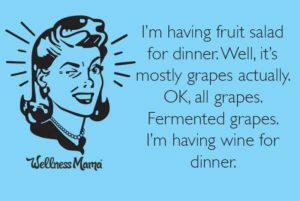 Unfortunately, we don’t live in a perfect world so of course there are also a few downsides to some types of wine. I started researching the health benefits of wine months ago and was shocked at some of the information I found. I’d always focused on organic or wines made in the USA since I try to buy organic and local whenever possible. This changed when I researched wines. It turns out that the great majority of domestic wines are highly processed and contain additives. Also, if they aren’t organic, they practically all contain glyphosate as well. Glyphosate is also known by its brand name, Roundup, and because US soil is so contaminated, it was found in almost every US wine that was tested, even organic ones. Those of us who experience headache, brain fog or other negative effects from wine may just be reacting to the additives, not the beverage itself. Ever gotten purple teeth from drinking a delicious red? Turns out it may be an additive called Mega Purple and not the wine itself! There are dozens of approved additives for wine, yet you may not want to drink some of them. Vintner’s can add these without disclosing it on the label. Mega Purple & Ultra Red– You probably think the dark red/purple color is natural, right? Not so fast! Manufacturers can add these super-concentrated coloring agents to change the color. According to Abel James, manufacturers add 10,000 gallons of this stuff to an estimated 25 million bottles a year! And it isn’t just for color. These additives add sweetness (and sugar) as well. React to food dyes like many people? This could be the reason you don’t do well with wine. Sawdust– Another flavor hack. Some manufacturers add sawdust or wood chips to the process. This provides tannins and the flavor of an oak barrel at a lower price. Commercial Yeasts– These may be the real culprits of the wine headache, especially for those who have histamine issues. Many manufacturers add commercial yeasts to speed up the fermentation. Many of these commercial yeasts are GMO. The best wines use only natural wild yeasts. Sulphur– A somewhat controversial ingredient that is added as a stabilizer. It can also kill unwanted bacteria and wild yeasts. This is one additive that manufacturers must disclose, since a small fraction of people are highly sensitive to sulfur. Sugar– Typically added during the fermentation process. It doesn’t make the wine sweeter like Mega Purple and Ultra Red, but it does speed fermentation and increase the alcohol content. 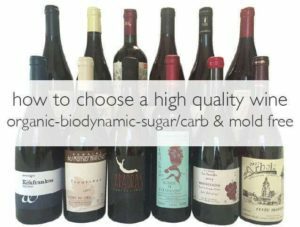 Natural wines without added sugar are typically lower alcohol for this reason. Fining and Clarifying Agents– Added to change the finished flavor or profile. Egg whites are an age-old fining agent (which means some wines are not vegan). According to Wine Folly, other fining agents include: Dairy products (like milk and half and half), Isinglass (fish bladders), Gelatin, Protease (derived from pork or cow pancreas or stomach), and Casein. Pesticides and Herbicides: Most non-organic wines contain traces of pesticides and herbicides. Round-up is the most used herbicide in US vineyards. All of my research had me almost ready to give up wine forever until I met Todd White, founder of Dry Farms Wine at an event earlier this year. Todd was well-versed on all the problems with most wines, but had figured out a solution. He founded Dry Farm Wines on the premise of using lab testing to find the highest quality wines that are free from additives. Sugar free– Their wines are lab tested for fructose and glucose, the two sugars found in wine. All contain <1g/L of total sugars, statistically sugar free. These low/no sugars are naturally occurring, nothing added or taken away. Carbs in wine come from the sugar content, since these are sugar free, they are also statistically carb free. Todd is on a strict keto diet and is able to drink these wines witohut a problem. Mold/Mycotoxin Free– These are tested to be free of Ochratoxin A, a known carcinogen. When I found out that Todd’s wines met these strict criteria, I had to try them and I was amazed at the difference! I immediately noticed the smoothness and slight tang most of all. There was a definite difference between these and most other wines I’d tried that had a chalky feel that stayed on my teeth (probably Mega Purple). It seems like the only downside of Dry Farmed Wines is the price. They are pricier than most conventional wines at local stores, but most high quality organic products are. Also, I’ve found the price well worth it since only moderate wine consumption is encouraged for the health benefits. I’d rather drink higher quality wine less often than drink more of the bad stuff! Since, I wasn’t able to find any other wines that were lab tested to ensure quality, Dry Farms are the only wines in our house now. Since the studies are not conclusive on the health benefits of wine, there doesn’t seem to be be enough evidence to encourage non-drinkers to start. 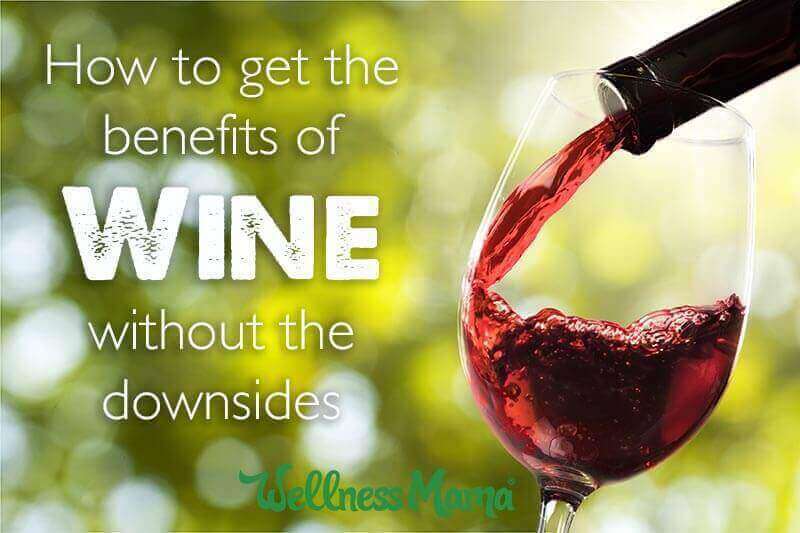 But for those of us who already enjoy this nectar of the gods, there are some great benefits, especially from high quality wines like the ones mentioned above. Because of my research, I now (almost exclusively) drink wines that are free of common additives, sugars, and contaminants (and I use the empty bottles to make mosquito-repelling tiki torches). If you want to try Dry Farms Wine, click here to get a bottle for a penny with your first order. Then grab your wine key (my husband the ex-bartender loves this one), some good chocolate, and enjoy! Like I said, they are pricer (but so is organic food), yet I’d personally rather drink less often and enjoy higher quality wine. Me too, Tommy, me too. Are you a wine drinker? Did you know about all of the additives in many conventional wines?